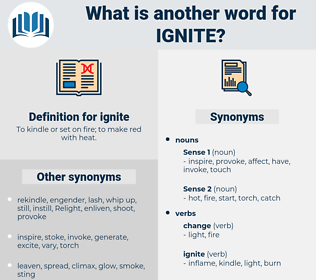 What is another word for ignite? To kindle or set on fire; to make red with heat. detonate, stimulate, generate, burn, burning, initiate, illuminate, unleash, foment, instigate, elicit, kindle, explode, precipitate, erupt, arouse, incite, fuel, engender, awaken, evoke, inspire, flash, turn, encourage, energize, induce, create, galvanize, cause. dull, dim, obscure, darken, blacken, subdue, snuff out, cool, snuff, put out, stamp, suffocate, stifle, douse, choke, smother. All that Chirac had to do was to ignite the lamp and put the saucepan on it. They saw the shells of the shore batteries ignite portions of the fortress on the island. 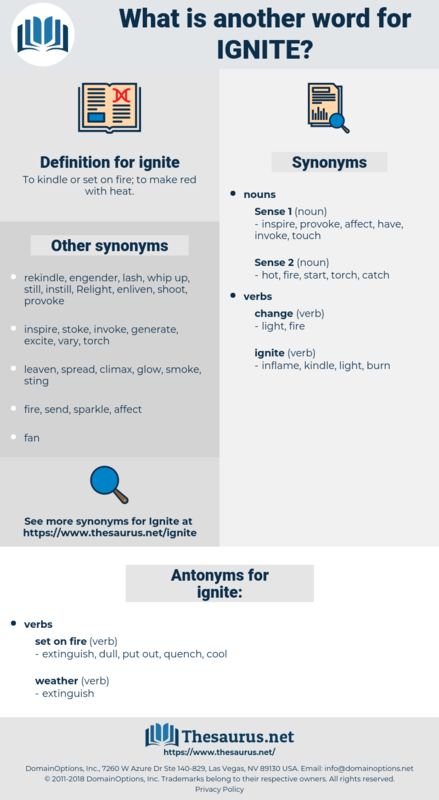 inflame, flare up, light up, reignite, light, kindle, conflagrate, enkindle, fire up.